“Be prepared for a possible cold swim. Two and three years ago the water temp was in the high 50’s. This past year was a fluke with water in the high 60’s. I don’t expect it to be that warm next year. “Did the 70.3 as my first HIM ever last year. It’s a beautiful course…. pretty tough too, since it was raining for a good part of it. A friend DNF’d because he’s a no-body-fat runner, got hypothermia on the bike — teeth chattering and hands shaking with wet slippery brake levers is no way to go down that one big hill on the course. After reading those two comments, I admit, I was somewhat nervous, since I am not a fan of biking hills.Nor becoming hypothermic. Alas, the time has come for me to prepare for the training program for the HIM. I consider this this time as a “warm up” for the actual training program, since the plan does not start for another couple of weeks. This is the first time I’ve actually searched and studied training plans. I briefly touched upon the fact that I do not really train for races–for marathons I’ve done, something would come up and interfere with my training, so I’d end up saying, “oh, bag it!”For my “training” that I did do, for recent duathlons, I didn’t really follow a plan; I would just run and ride my bike on my days off, or quick run before work. My sleep habits were poor- my body did not seem to know which way was up, and which was down, which affected how I was able to train. A triathlon training plan encorporates weekly scheduled bike, runs, and swim sessions. There are days where you need to both swim and run, or days that you run and bike. There are workouts which are built on endurance, and on speed. There are also workouts where you work on transitions. The first couple weeks build on base endurance through tough work and periods of recovery. Over time, the amount of hours you spend training increases- as the workouts get longer, they also get harder. This is going to be a challenge with a rotating schedule like I have. The plan I’m following suggests doing activities outside if you can (fine by me!). But, a major fact is I miss most of the daylight from my job. (That’s why I run in the night, and just bought a Kurt Kinetic Road Bike trainer, so I can bike indoors). The cold, crappy weather, however, should not affect my ability to train at Bard. For my training today (first training day, woohoo! ), I went for a five mile run on the treadmill since it was pouring outside. I’m not a fan of treadills, but if there is a hard rainfall and dark outside, I’m taking it to the gym. 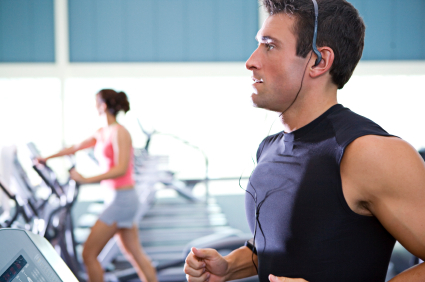 Treadmills are not that bad-they help when you want to do speed intervals. But honestly I prefer to run outside as much as I can. I also went to the pool this afternoon around noon, which was a time designated for lap swimmers. There are different workouts that can be done. I just swam for 50minutes.The swim actually went well, and tomorrow my workout will be a total of 1000yards. By the end of the training. your swim workout leads you to swill 2500 yards to prepare for the 1.4 mile swim at the race. I could actually go on about this. There are numerous books out on the market for triathlon training, The Triathlete’s Training Bible by Joe Friel, is excellent….I’ll be sure and keep you updated! Previous Night Running Next Indoor riding?